UW holding on to their one-goal lead with 4:36 on the clock. Tischke gives Wisconsin the lead back (5-4) at the 11:03 mark of the third. Down to 4:36 left with UW leading Michigan 5-4. Announced attendance 13,326. #SmirnovIce may have just given the #Badgers a chance to tie atop the Big Ten. 3-2 PSU with a minute to go. Kunin down for a block on a Piazza shot with 2:15 left. 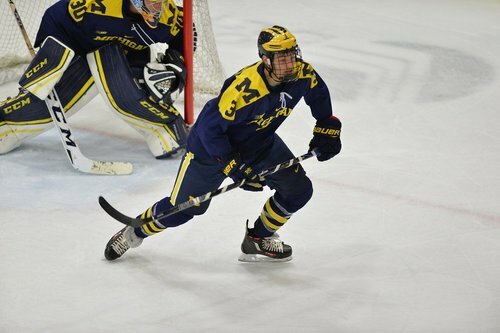 Michigan pulls their goalie with 1:50 to go in the game. Michigan pulls the goalie but goes offside with 1:51 left. Timeout Wolverines. 1:24 3rd | Nags is pulled for the extra-attacker. Michigan pulls their goalie again with 1:10 left. Nagelvoort out again with 1:11 left. Jurusik denies Sanchez from close range with 44.8 left. 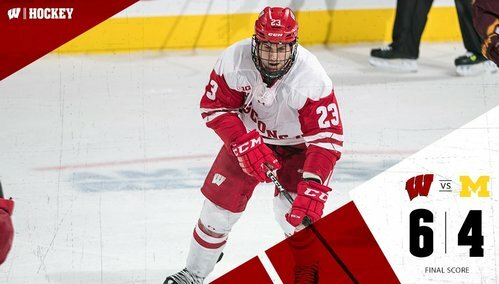 BADGERS GOAL: Aidan Cavallini scores into an empty net after winning a race to beat icing. 6-4 Badgers with 36.5 left. FINAL: Wisconsin beats Michigan 6-4 for a series sweep. #Badgers will now await final from Minnesota-Penn State game to see where they are at in the Big Ten. FINAL: Michigan falls to Wisconsin in a hard fought back and forth battle all night, 6-4. Minnesota ties it in regulation with 3.5 seconds left, then wins it in overtime. #Badgers still three points back of Minnesota in Big Ten. A #Badgers record set tonight in the 6-4 win over Michigan. Find out more with the video recap.